The Philippine economy is staging a comeback this year with lower inflation and expecting peso to rise versus US Dollar to 50 in the next 12 months. After last year’s inflation shock, a 5 percent slump in the currency and a widening current-account deficit, pressure is starting to ease. Consumer-price growth slowed last month, the peso and stocks are rebounding, and the current account is set to remain manageable. Economic growth is expected to exceed 6 percent and reserve buffers are among the strongest in global emerging markets, according to Moody’s Investors Service. The benchmark Philippine stock index has risen more than 7 percent this year, the biggest gainer in Asia. The peso is up 0.8 percent to 52.2 per dollar, after being one of hardest hit by an emerging-market rout in 2018. Goldman Sachs Group Inc. forecasts the peso will strengthen to 50 per dollar over the next 12 months, according to a note on Monday. The tightening in financial conditions last year should slow domestic demand and import growth, helping support the current account, it said. “There’s more room for the peso to rebound, with sufficient reserve buffers and quite solid fundamentals,” said Koji Fukaya, chief executive officer at FPG Securities Co. in Tokyo. The Philippines has the advantage of having low foreign debt obligations. 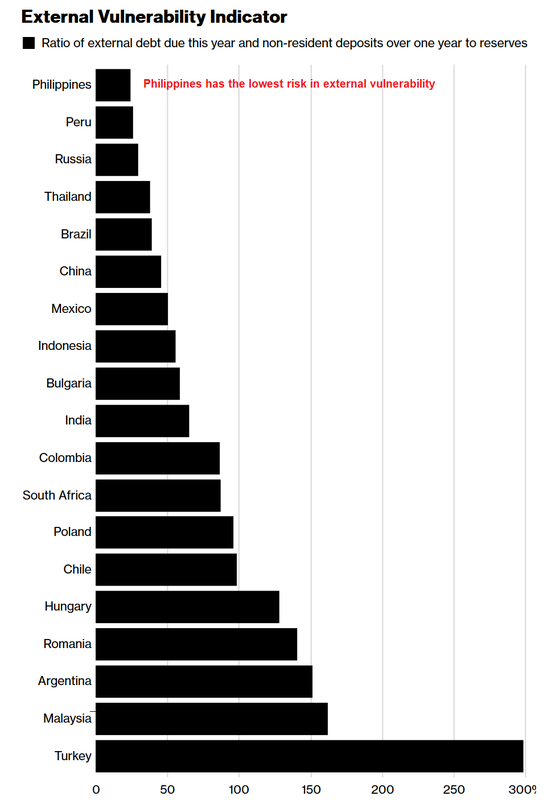 External debt payments due this year and total non-resident deposits over one year are estimated at 25 percent of foreign reserves for 2019, the lowest among 19 emerging markets tracked by Bloomberg, according to Moody’s forecasts. Remittances from Filipinos living abroad are a key pillar of support for the economy and the currency, amounting to 10 percent of gross domestic product. Those inflows rose 2.8 percent in November from a year ago, according to data released Tuesday. As economic fundamentals firm up, they should offset risks including a prolonged U.S.-China trade war and an uptick in world oil prices, which hampered the economy last year. “The waters are no longer murky. Investors are ready to dive back into the Philippines,” Ravelas said.